as most of you know, I spent the month of May hiking across Spain, following in the footsteps of millions of peregrinos — and plenty of non-religious folk — who’ve made the pilgrimage to Santiago de Compostela over centuries. over 34 days I walked nearly 800 kilometers. 500 miles. over one million steps. approximately the distance from Jacksonville, Florida, to Key West. or Duluth, Minnesota, to Gary, Indiana. however you quantify it: a huge distance and the most physically demanding adventure I’ve ever undertaken. while Spain was next on my list of places to visit, I can’t take credit for the idea for this trip. I don’t know nearly enough Germans to have come up with an idea as crazy as this. but the person I went with had a friend (a German) who’d done the Camino over several months a couple of years ago and who planted the idea in his head. 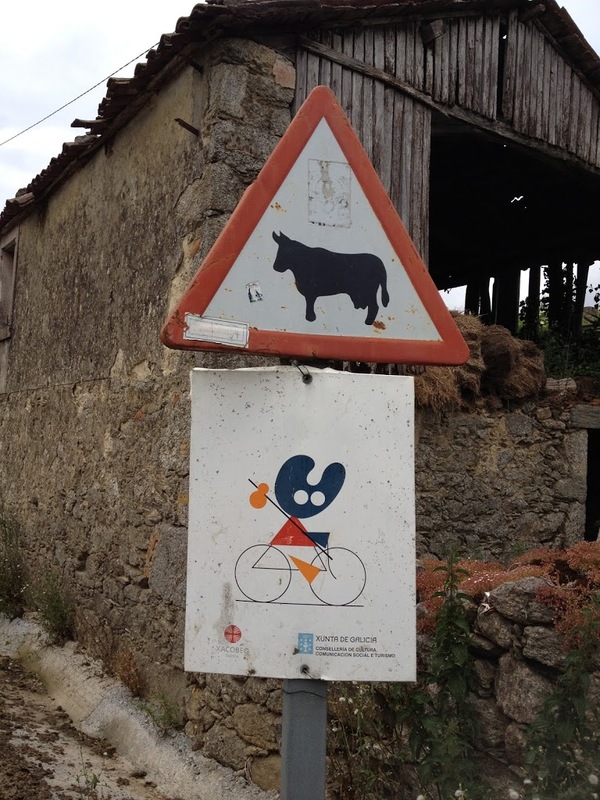 when it came time to use the four weeks given to him, the Camino wasn’t just the obvious choice, it was the only choice. so we planned, booked our flights, figured out transportation to our starting point, took long practice hikes that couldn’t really prepare us for the physical demands we’d face, booked hotels in many towns and trusted to the Camino infrastructure elsewhere and, on May 4, headed to the airport. our guidebook proved unhelpful in explaining the most interesting cultural and historical sites we passed (more than enough on all the religious and “mystical” sites to our continual chagrin), which just means I’ll have my research cut out for me as I prepare posts for here. we’ve now sorted through all the photos, so the first phase of getting posts ready has concluded — stay tuned over the next several weeks for more about our adventures! after spending a week sleeping on planes and in hostels, I relished the idea of spending a night in a town too small to have something so large as a multi-bed hostel. after staying an extra night in Český Krumlov I had one free night before my reservation in Olomouc. because Czech Republic is relatively small (by U.S. standards, at least — it’s about the same area as Ireland) the drive from the former to the latter is only about four hours, though something closer to six by bus via a slightly more complicated route. after some consideration, I’ve settled on a unifying element of my trip to the Czech Republic: walking. my accidental 28km hike was just one of many foot-borne excursions I enjoyed during my travels. Czechs, I came to understand, enjoy their outdoor activities and hiking and biking trails snake everywhere across the countryside. before I left, I spotted tips in my guidebook for people looking to hike the length of either the Czech Republic or Slovakia and thought the idea absurd — what country has the hiking infrastructure to allow people to hike that far? to make an enjoyable vacation out of the activity? the Czech Republic, I now know, for one. presumably Slovakia for another. I went into a bookstore in Wenceslas Square in Prague looking for a standard, nationwide roadmap like the one I got in Ireland and there were nearly as many detailed local and regional ordinance survey recreational maps as there were for maps for the rest of the world. walks around Český Krumlov, around Prague, around Štramberk, around Olomouc, around Brno, around the Mikulov region … you name it, there was a recreation map to cover your needs. maybe two. however, for those like me who don’t deem such detailed ordinance maps necessary, the trails are so adequately marked that you’ll do all right without them. as long as you know your destination, or the next town on your path, then the periodic signposts and painted markings on trees and farmhouse corners will lead you in the right direction. of course, you might be better off to have the hyper-detailed maps (or at least to consult them during a planning stage) so that you don’t end up hiking three times farther than you think you will hike and run most of the way back to town so as not to miss the last bus back to where you’re spending the night … but that adventure is for another post.